Elizabeth Haddon was born May 25, 1680, in Southwark, London, England. By the age of six, Elizabeth had probably begun her education. She was also actively interested in her mother’s charities, and as she grew older, she went on modest little charitable ventures of her own. On one occasion, so the story goes, she asked her mother to let her have a party, and when the guests arrived, they were six tattered youthful beggars of the most forlorn London type. In 1698, Elizabeth’s Quaker father, John Haddon – a friend of William Penn – bought a 500-acre tract of land in Gloucester County in the English colony of West Jersey to escape religious persecution. Mr. Haddon was required to take physical possession of the land within six months, but poor health kept him from making the trip. Haddon sent his 21-year-old daughter Elizabeth to the New World to claim the property. The voyage, after weeks on the water, was safely accomplished, and she landed in Philadelphia, where some of the settlers were still living in caves by the riverside. She arrived in June 1701, and named the new property Haddonfield, in her father’s honor. Located geographically at a critical point, where the navigable portion of the Cooper River crosses the King’s Highway, which ran between the early settlements of Burlington and Salem, it was inevitable that a community would be established within a mile of this site. Elizabeth Haddon welcomed and studied with local members of the Unalachtico Lenape tribe to learn their customs. She took a particular interest in their sophisticated use of a broad range of plant material for medicinal purposes, and would use that knowledge throughout the rest of her life to treat wounds and illnesses in her growing wilderness village. Shortly after her arrival, Elizabeth Haddon made a marriage proposal to John Estaugh, a Quaker minister, and they were married in 1702. Their courtship was described by Henry Wadsworth Longfellow in “Elizabeth,” a poem from his Tales of a Wayside Inn. At first, the couple was engaged in simply establishing themselves and running the land owned by Elizabeth’s father. They had no children, but they brought her sister’s son, Ebenezer Hopkins, to America from Southwark when he was about five, and raised him as their son and heir. Ebenezer was the founder of the Hopkins family of Haddonfield. In 1713, John and Elizabeth built a three-story brick mansion called New Haddonfield Plantation. There, she managed the family property while her husband tended to his missionary journeys. The Brew House she built in 1713 still stands in the backyard. In this brick structure, the enterprising young woman made medical and chemical preparations, and, it is said, some whiskey. The establishment of the community of Haddonfield was assured when in 1721 Elizabeth’s father gave her a deed for an acre of land for a Quaker Meetinghouse and burial ground. She served as clerk to the woman’s meeting for nearly fifty years and was well known for her charity to the sick and the poor. Once the Friends Meeting was established, Haddonfield quickly became the center of commerce for the large, successful farms of south Jersey. Farmers came to town for the blacksmiths, tanners, saddlers, general stores, taverns, and all the necessities required for them to be successful with their farms. Produce and animals from the farms supplied the growing needs of the nearby city of Philadelphia. 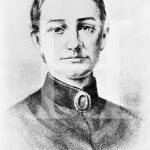 John Estaugh had some knowledge of medicine, and he and his wife were famous for their skill in nursing and healing. Besides acting as a doctor to many of her neighbors, Elizabeth was the clerk of the Quaker Women’s Meeting for almost fifty years. John Estaugh died in 1742 on the Island of Tortola, while on a religious visit to the West Indies. Elizabeth maintained her leading role in the town, and managed her own property as well as the estates of others – an unusual responsibility for a woman in colonial times. In 1750, there were fewer than 1,000 Lenape left in all of New Jersey. One can only imagine Elizabeth’s anguish as she watched this native culture collapse. The systematic elimination of the local aboriginal people was a topic of much discussion and debate. Many, perhaps most, white colonists hailed it as a triumphant event. But in Haddonfield, the outspoken Mrs. Estaugh viewed it as a shameful and completely un-Christian campaign against a worthy and once-proud race of fellow human beings. In 1759, the region’s last Indians Kings signed a treaty relinquishing all remaining rights and claims in New Jersey, and led their people west in search of new land beyond European control. 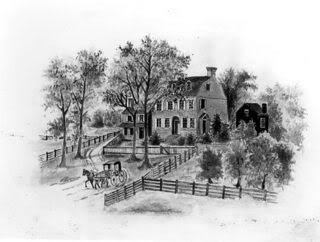 The 100 or so Lenapes who elected to stay in New Jersey were sent to live at Brotherton, one of America’s first reservations at Indian Mills in Burlington County. Elizabeth Haddon Estaugh died on March 30, 1762, at the age of 82. 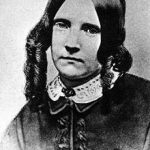 She had proved to be extraordinary in a number of ways, including her fierce sense of personal independence, in an era when women had few rights, and in her zealous dedication to Quaker beliefs. She retained to the last, control of her affairs. The Lenape who migrated inland became part of a vast population of similarly uprooted native peoples who continued to be pushed further west by the unstoppable expansion of the civilization that became America. In 1802, the government of New Jersey quietly sold off the Brotherton Reservation, and used the proceeds to remove the tiny group of impoverished inhabitants – the last of the Lenape – to upstate New York. In 1890 the Federal Census was able to identify only 84 Indians in all of New Jersey. Today the descendants of the Delaware Valley’s Lenape tribes can be found scattered across reservations in Texas, Oklahoma, Wisconsin and Ontario.